I have been testing this Bath on behalf of being an Argos Tester. This product has been sent to me in order for me to try it out and write about the functionality and purpose of it. My honest review is first posted to the Argos website. My review is now live and has been submitted and accepted to Argos so I can now share this item with you. 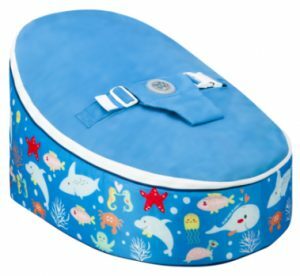 The dual stage Munchkin Sit and Soak Baby Bath has soft blue foam at the back for baby to lean against and the same with a shape at the base too. This surface gives friction for baby’s skin to be against and is designed to help them stay in place comfortably while bathing. The white lump in the base is to keep baby in place as they sit. Their bottom goes behind it with their legs going over the top. It must be comfortable because my son had no problem sitting in it from the first moment we tried him inside. It has a water full level part way up. Always follow the instructions of use. It is designed for optimum comfort allowing your baby to stay warm during bathing. The whole bath is lightweight and it’s dimensions are Height 38.4cm, Width 41.2cm, Depth 64.5cm. There are useful warnings and safe uses on the inside of the bath on a sticker. Of course common sense is required when aspects like water are present. This bath is only to be used by adults, children are not to be left unattended at any point whilst in the bath, and you must follow the guidelines. The bath has an attractive shape that is easy to get in and out of a bath tub and easy to fill. It has a handle for ease of lifting when it is empty. There is an easy lift able drain in plastic covering holes in the base, when bath time is finished it is easy to drain the tub without the need of tipping or lifting. This innovative pull tab is ideal for everyone to use because it’s so easy to use. The innovative pull tab in order to drain the bath after use. This design is very useful and I think a key selling point of the bath. This bath is very functional without taking up lots of space in your home. You can easily hang it on the back of the bathroom door when not using it. Our son was 8 months old at the time of testing and he sits comfortably in the bath and is even able to touch the sides. He found it good fun to be able to sit unaided by us due to the insert in the base, and he enjoyed the water. 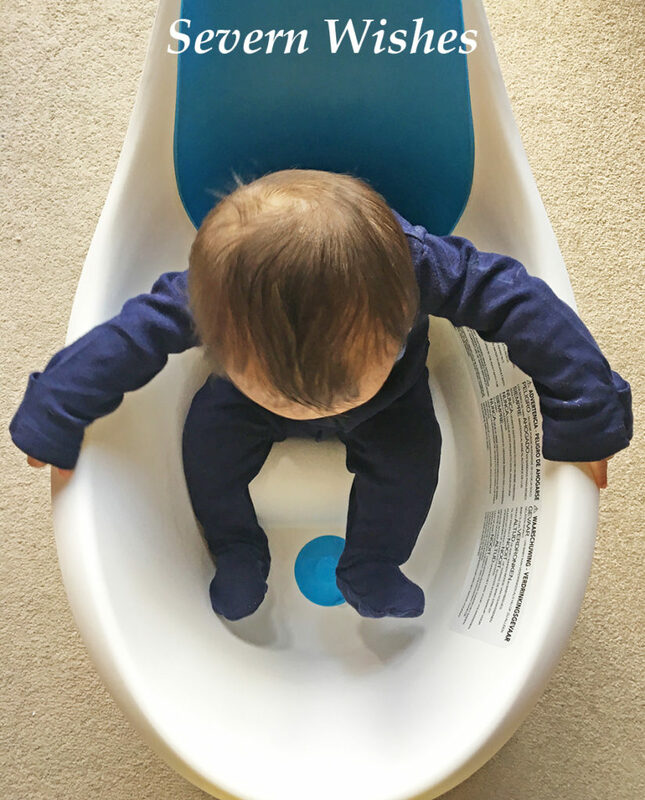 My son demonstrates how a baby would sit inside the bath tub so you can see without any water inside. Their bottom goes behind the inserted structure and the foam keeps them in place. The drain can be seen at his feet. Overall I am happy that I have had the opportunity to review this item, and because it is good for babies up until the age of a year we still have plenty of time to use and enjoy it. You could even pop it outside on a flat surface in the summer months and use it as a pool type of thing. It has a non-slip base and is sturdy when placed upon a flat surface. 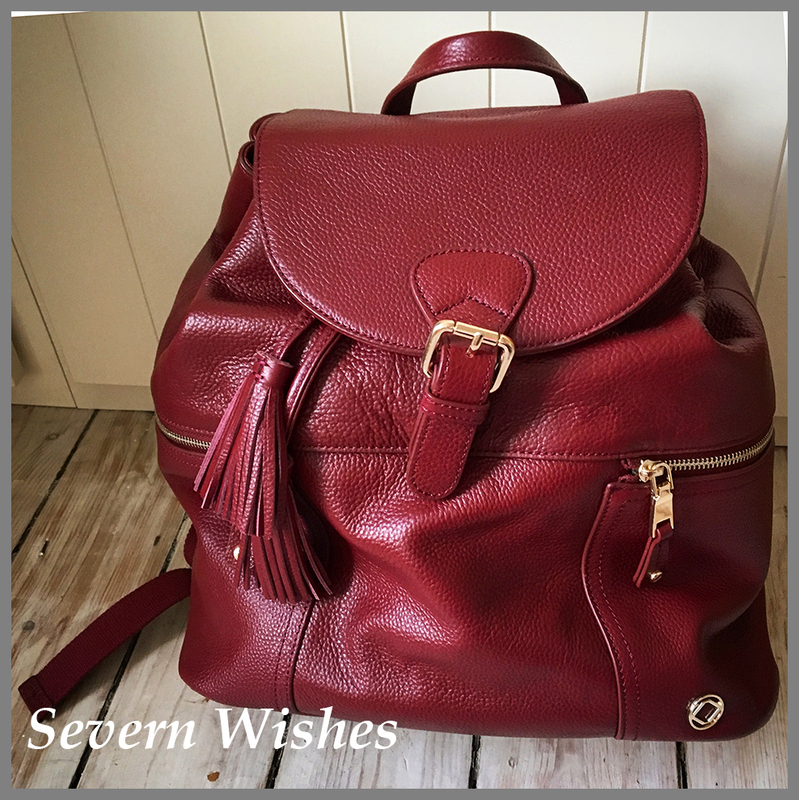 Thank you for visiting Severn Wishes today, I hope you have enjoyed this Review and that you come back here for more soon. 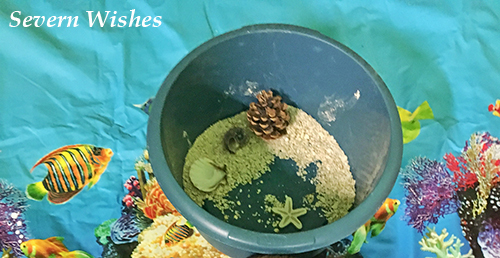 Beach Theme – Under The Sea. 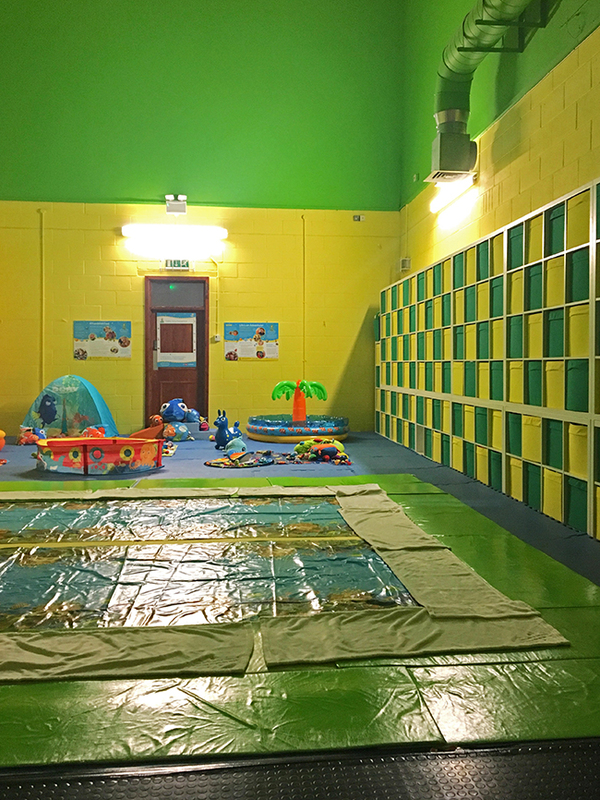 Using textures, sounds, bubbles, bright colours, animals, music, voices, singing, shiny surfaces, sign language and toys… Baby Sensory has something for babies of all ages. This class that I attended was for babies of only a few weeks old right up to 13 months. Our son Baby A has just turned 6 months old, so he was able to appreciate a great deal of what was going on. There were various mats on the floor for parents to sit upon and soft mats to lay babies upon in front. The class interacted with the children on many levels, be it laying on their back, sitting up, laying on their fronts, and sat upon their parents laps even! There is always a hello and a goodbye section of the class, then in between is a theme plus a short break midway through for feeding and changing, or just more playing. Sand was substituted for oats so that babies weren’t in any danger if they happened to eat any. I thought this was a great idea! A variety of textures were used doing the hour, silk, organza, bubbles and soft mats. Sign language is used during songs to make the babies think about the words being sung and said. This is also a really nice part of the group activities. I have paid for a course of classes for my son and I to attend. I feel it’s a good idea to introduce him to other babies, various sounds and activities that I cannot do very easily at home. Plus it’s a good reason to get out of the house and for my son and I to have some fun learning things together. If there are classes in your town I recommend that you give this type of learning class a go! If you find a good one the activities can be essential to your baby learning things and experiencing things in a safe environment. There are many things that I teach Baby A at home, and also when we are out and about. Such as pointing out colours, numbers, weather and words as well as the basics like animals and objects. You don’t need to spend a lot of money on things, and you can use items at home to create sensory things. I really enjoy showing my son real objects. Ones that make noises and have great textures are the best types. We often use toys and explain what in reality they are based upon. We try and expose him to educational television programs and we try and use books daily too. Ones with pictures are best at the moment but we always interact with the books with words and noises to help him understand further. Young babies can only see Black, White and Red colours, so it’s a good idea to begin showing them shapes and every day objects and short words that are designed in this colour pattern. As baby gets older you can show them more colours and build upon it week after week. Repetition is the best way of learning, and a baby will begin to recognise objects from an early age when shown them on a regular basis. Our son liked particular animals that were on flash cards, so we aimed to buy him other things that had these things as the theme. Such as he liked the image of a snail in one of the books and so we attached a snail hanging toy for the arch on his play mat. My Top Tips for teaching your child things at home, are to incorporate a section of learning time into your routine so that once a day your baby is learning. Use repetition and do any teaching when your baby is most awake and alert. Making the learning fun means your little one is more likely to enjoy it and recall aspects of it. Learning with your child should be an activity that you can both enjoy, you can always get other people involved too such as grand parents and friends. If there are babies of different ages in the room you can get everyone to do things in a way that they would all benefit. Such as explain colours and objects to the younger baby while getting an older child to spell the word for example. If anyone found this post useful then please leave me a comment. I may elaborate on ways that I teach if people would find it beneficial. And also explain about the items that I have made and created for our at home sensory experience. 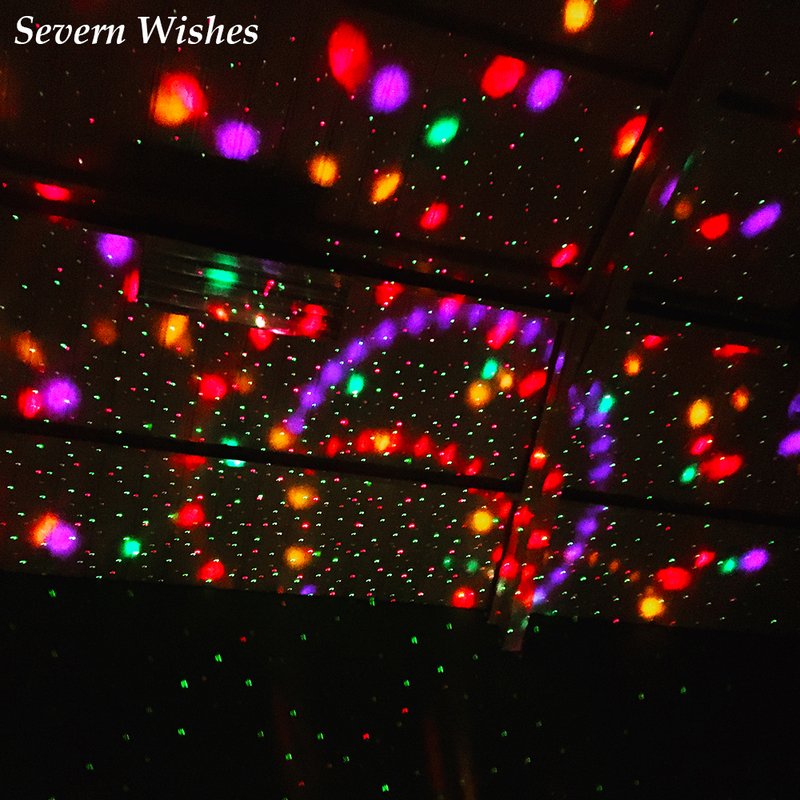 Thank you for reading my blog today and for visiting Severn Wishes, I hope you’ll stop by again soon. Have a great day! It’s not always easy to find comfortable and practical clothing that you can wear in the colder months that’s both suitable for breastfeeding and preventing you from freezing in the process. I’m like many other mum’s out there who consider buying things to help themselves out, are usually last on the list of priorities. However on a recent window shop scroll through the boohoo website I saw something that I knew for me would be a game changer. 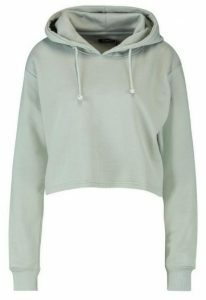 For £12 boohoo are selling cropped hoodies. This might not sound like anything special, but we’re fast heading into winter now. Considering I’ve been getting cold in cardigans and other loose articles of clothing that won’t get in the way of my son feeding… this was exactly what I had been waiting to find. Not only has this hoodie allowed me to feed more comfortably, but it’s changed the way I feel about feeding my son around people who are not immediate family. It has given me confidence and hasn’t cost the earth. So many Maternity and Nursing items are highly priced, and at a time when you’re already forking out lots of money, you shouldn’t have to spend a ton on items to simply help you to accomplish what is both natural and a necessity for you and your baby. The hoodie material is soft and thick, because it’s cropped it means that I can keep my arms inside the fabric, and just simply lift one corner to expose what I require for the feed. This hoodie is ideal to wear all year round, with shorts and a T-shirt or with jeans and a tee in the colder months. 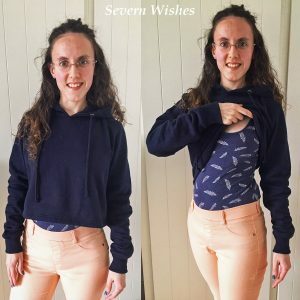 I’ve found this hoodie to be more than adequate for what I need, it’s both comfortable and practical, and doesn’t cost the earth either! 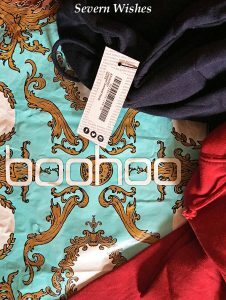 I highly recommend this style and quality of item from BooHoo and am very happy with the ones I bought. As you can see me demonstrating in this image above, it’s easy to lift one corner of the hoodie. I normally am able to simply tuck the fabric up underneath and out of the way. 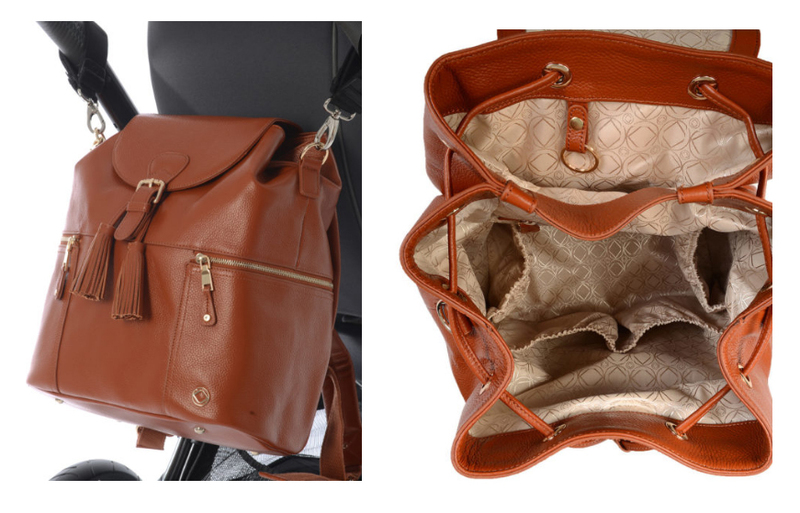 Was Available in Black, Navy, Wine, Pink, White, Grey and Tan. Quality of Material – Very good, it washes well and wore well afterwards. The material is soft and comfortable on the skin. Fitting to Size – I ordered a Small size because I’m usually a Size 8. It fitted perfectly along my arms and around my back and neck. Overall I’ve been very happy with my purchases, and I would purchase items like these again. We often throw away a lot of fruit and vegetables that have a habit of going off before we get around to using them. 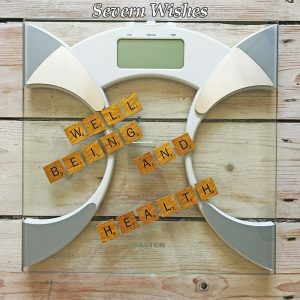 In this post today I’m going to outline the ways in which I make the most of vegetables and how easily you can so to. Sabrina’s Top Tip is to invest in a blackboard or a meal planner or even both! That way you won’t forget to use what’s in your fridge! Plan out one night a week that is a Treat Night where you can have something tasty like chips with your evening meal, but otherwise mix up your vegetables so as not to get bored with the weekly selection. You often get a lot more veg for your money with frozen, and it’s just as good for you with most brands choosing to freeze hours after the vegetables are picked. Frozen often gives you more per kilo as well, with things such as broccoli because you’re not paying for the weight of its stork, or spinach for example which is frozen in far larger quantities than you find it in fresh packets. Frozen veg also has the added benefits of you only using what you need each time rather than you wasting with cutting sections of fresh veg up when preparing them. Usually I make a soup or a sauce out of veg that needs using up, or left over veg that wasn’t all eaten during something like a roast dinner. Use your Peelings – They are the most nutritious parts! If you often peel potatoes, parsnips, carrots and sweet potato, but throw those peelings away, you should consider making your own vegetable crisps out of them. A greatly tasty and healthy snack for children between meals or as a starter while the evening meal is cooking. Keep them for 48 hours in a clean lidded Tupperware box to keep the crunch! If you prepare Cauliflower and/or Broccoli regularly, do you ever use the stems? There are a few options to save you throwing them away. Make Cauliflower Rice by putting the stems and any left over florets into a processor to make cauliflower rice. Make an easy vegetable curry by cubing the stems of cauliflower with any left over potato and cook them a little longer than you would usually to soften them up. You can take broccoli stems and either shave them finely using a peeler and fry them with stir fry vegetables or dice them and add them to pasta dishes. Look into buying Seasonal Vegetables that are on offer in Supermarkets. Some of the larger ones in the United Kingdom do weekly deals too! Make sure you plan your week around this and use up the items that will spoil first so as to ensure no waste. I hope you’ve enjoyed this short post and my vegetable tips! There is always a vast array of advice that is hurled around when you’re pregnant or a new parent. Some of it I found wasn’t all that useful because it was either peoples opinion that was exaggerated or it was biased. 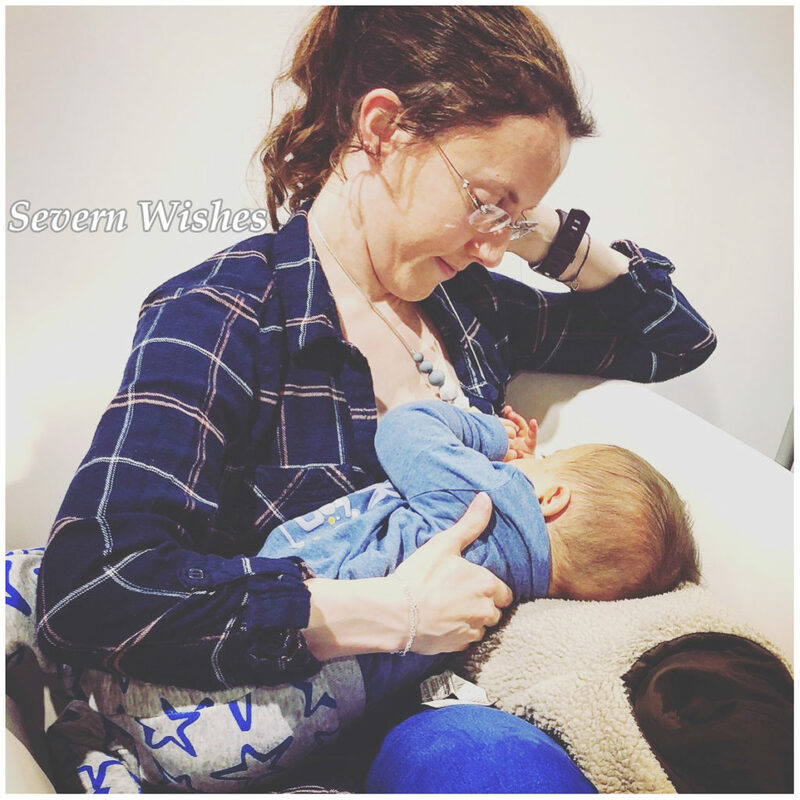 Every parent and every baby is different, but I hope that you can appreciate my life honest post which is more about practical tips, rather than scare stories. I would never dream of telling someone how to parent, my tips are just my honest advice for what has so far worked for us. I hope that you enjoy my post. You’re going to want to stock up on food and drink and snacks. Leaving the house is going to take a lot more effort from now on so take my advice, do a bulk shop to fill your cupboards, do some bulk cooking of basics for your freezer and make sure you’ve got a variety of snacks in too. You will find those early morning feeds a shock the first few days and tasty sugary things will be your new best friend. I recommend Mini Cakes or Dried Fruit, definitely sugar! Caffeinated drinks will also help, but be careful about your in take if you’re breast feeding. My Top Tip – We keep a mini cool bag in our bedroom filled with snacks and bottles of water for those late nights and early mornings. It saves you from going downstairs when half asleep! I had a grand total of 4 Muslin cloths the week that my son was born. By the time he was a month old we had fifteen cloths! And some weeks it’s still not enough (with some being dirty or in the washing machine for example). My main tip is to always keep several at arms length. Then keep one at either of your bedsides, more than one in the area that you all lounge together, one where you change your little one and at least one in their changing bag too! There still won’t be one when you suddenly need it, unless you place a longer one over your shoulder while you’re at home. But on a serious note, these cloths are a godsend, especially when baby is having a sickly day, or is dribbling due to teething. 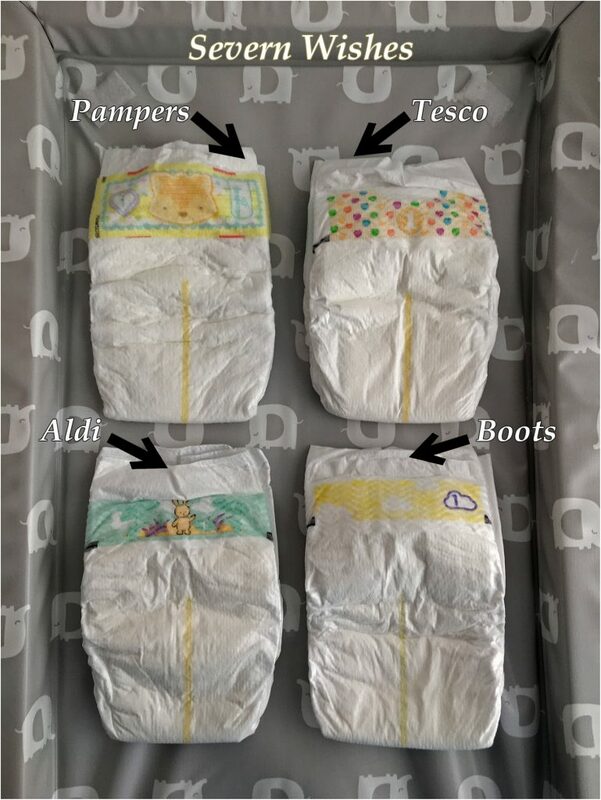 The best ones that we found for absorbency were from Mothercare, the softest were from Tesco. My Top Tip – Keep track of how many you’ve got so you don’t end up with them all in the wash and also purchase similar colours so they’re easier to wash in bulk! So you’re Right handed, well you may want to try using your Left more. You will find that once baby comes along you will only have one hand free and sometimes not even very often! So train your hands now before your baby arrives. Make sure you can blow your nose, make a drink and eat – all with the hand you wouldn’t usually use! That will set you up if you can master at least something. After eight weeks I can prepare and eat things, plus fill the washing machine and start that off all one handed. Before you have children you don’t realise what an overwhelming responsibility it is for most of the time. I kept hoping I would have the time to do things that I wanted, read a book, learn a new game, write a blog post… but the reality is nothing like that. Even if are lucky enough to have a baby who actually sleeps between feeds, there will always be clothes to wash, housework chores to do and getting yourself organised too! (Drink / Hot Meal / Shower and a Change of Clothes). The thing that your partner who works must understand is that just because you’re at home, doesn’t mean you get a break. Some days you will eat and even go to the toilet with your child in your arms, because that’s safer than putting them down and them screaming so loud the neighbours 6 doors down hear them! Compromise is the key. If your partner needs a break to shower or even go for a ten minute walk to get some fresh air, you need to support them. It’s tough being responsible for a tiny human, they rely on us 24/7 and sometimes we all need a few minutes to ourselves, mostly so we feel like us and not just Mum / Dad. Another way you can support one another is that one feeds the other winds, and keep swapping. Your baby needs to get used to both of you putting him/her to bed so that both of you can be a comfort. Finally remember that you’re in this together, if you’re tired take it in turns to take a nap. If one of you is feeling overwhelmed then do something nice together as a family and turn it into a positive experience. My Top Tip – Take things in turns and ask one another every day if the other is doing okay. So I found that within hours of having my son my instincts were kicking in. I knew things that I didn’t before and I had ideas about how to cope that came through the living experiences with my baby. 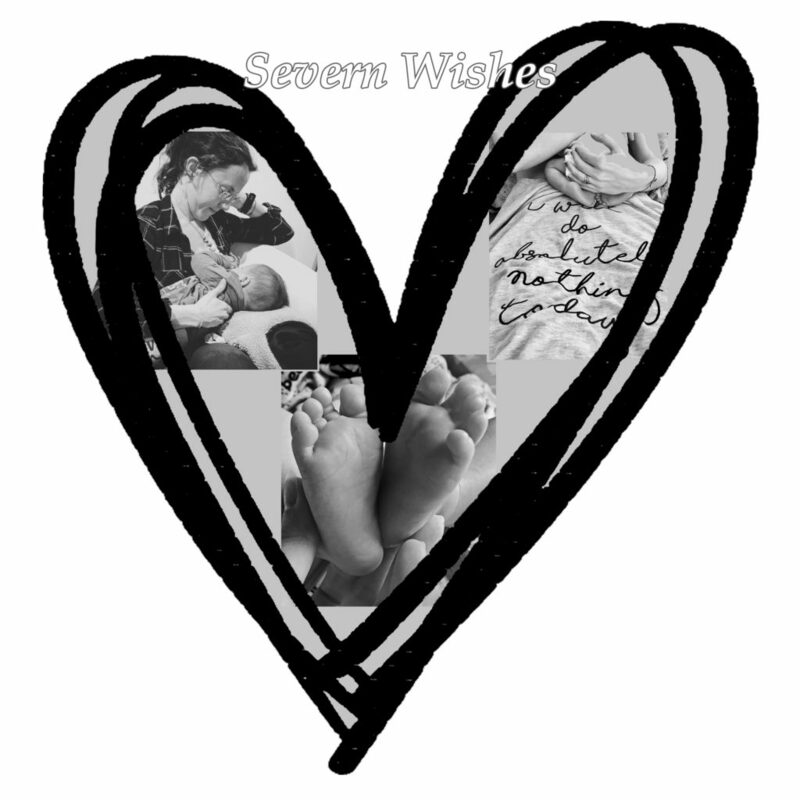 Trust that you know what your baby needs, and after a few weeks you’ll know what their cries mean anyway. Don’t be afraid of asking your own parents for their advice, and remember you don’t always have to take it from anyone especially if you disagree. You will know your baby after only a short time, trust yourselves. 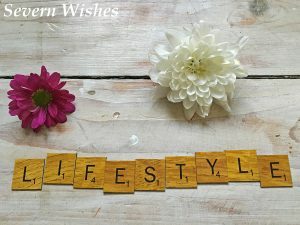 Thank you for your on-going support for me and my blog, please leave me a comment if you enjoyed this article. And don’t forget to follow me on Social Media to see what I’m up to on a more daily basis! I first saw the Baby Bean Bag on Facebook several years ago. 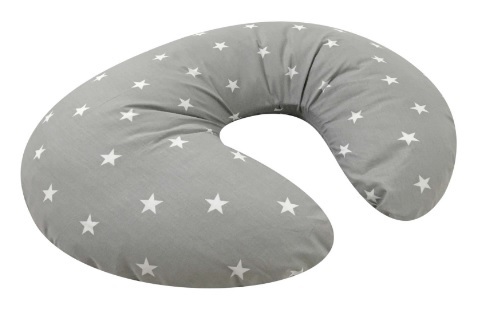 After years of following their page and reading customer reviews, when I got towards the end of my pregnancy I decided to order a Bean Bag for us and our new little one. What appealed to me the most was that the Bean Bag can be used afterwards for Toddler and Child as our child grows up. It will eventually be a part of their bedroom as somewhere comfortable to sit and read. There were many designs to choose from including unisex ones. You receive the Bean Bag with the Harness Cover and a Spare Non Harness Cover too in the same colour. Despite this I decided to order an extra harness one so that if our one ended up in the washing machine we would still be able to place baby on the bag safely. You do have to pay an additional £3.99 for the Bean Bag Filling, but they guarantee that it is Fire Safe Polystyrene balls that they use. 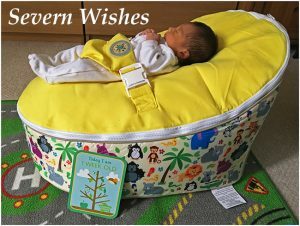 I featured these bean bags on my “Baby Wish List Post” and we had one given to us as a joint gift for our son from friends who read my blog. This excellent coincidence meant that we received two bags the week before our son came into the world. And it’s been very handy to have one on both floors of our house. 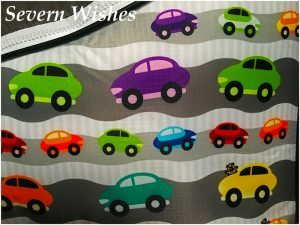 I purchased the Cars version of the bean bag in Grey, where as our friends got us the Safari one in Yellow. 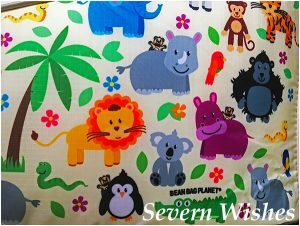 Here are some close ups I have taken of the very cool designs situated on either of the bean bag planet bags we have. The bright colours are inviting, and there is also a bear that you can find playing peek-a-boo on all of the designs I have seen. This is a cute addition so when children are older they can search for this little bear on the sides of their seat. So I wanted to include what my husband thought in this review too, I will firstly outline what I think and then dictate his thoughts. A very handy product to have in more than one room of the home, it is convenient to place baby into safely while you need your hands free. An ideal size and height too because you don’t have to bend too low to place baby into it. This item has become one that we use daily in our home to accommodate our needs between feeds and changes of our newborn baby. We cannot wait for him to grow with the bean Bag too and it will be used in his bedroom one day. I found the ease of ordering on the website a good experience, and there were a ton of great designs for us to choose from. As for delivery the bean bag comes wrapped and then boxed but is flat. You place the bean bags inner bag inside when it arrives. The quality of the fabric, bean bag base and the unique design of it, is what had me intrigued enough to buy. I have not been disappointed in the item. I did think they were quite expensive for what they are, but when you use the product as much as we do, its convenience outweighs how much I ended up paying. After using the product now for several weeks I have to say the easiest thing about them is the use, just place your child in the centre and strap them in using the harness. I am happy that I made this product purchase for our son. Here is a photograph of our son at a week old, enjoying a nap in his Safari bean bag. A versatile and good quality material that is soft for baby to lay on. Our newborn is always comfortable when lay on it. I like that our baby has a good view when laying on the Bean Bag too. It’s a useful item that can be easily moved around the home into any room or living space. We think they are that good a product that we now have 2 of them (thanks to a gift)! We use 1 for upstairs and 1 for downstairs! The bean bag itself is good value for money however be aware of the additional charges to fill the bean bag with the polystyrene balls, and there are quite high delivery costs as well. I would recommend this product and it’s a good idea for first time parents. It’s also useful for parents with pets because it allows baby to be quite a lot higher than the floor and therefore easier to keep an eye on unlike the mats that require babies to be lay on to a flat surface on the floor. 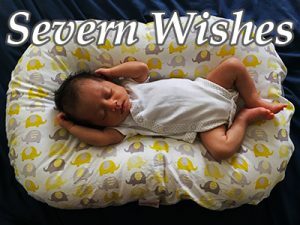 Here is another image of our son, as you can see he is happy and content on the bean bag, awake on this image as opposed to asleep on the previous one. Here are some Bean Bag Planet designs. 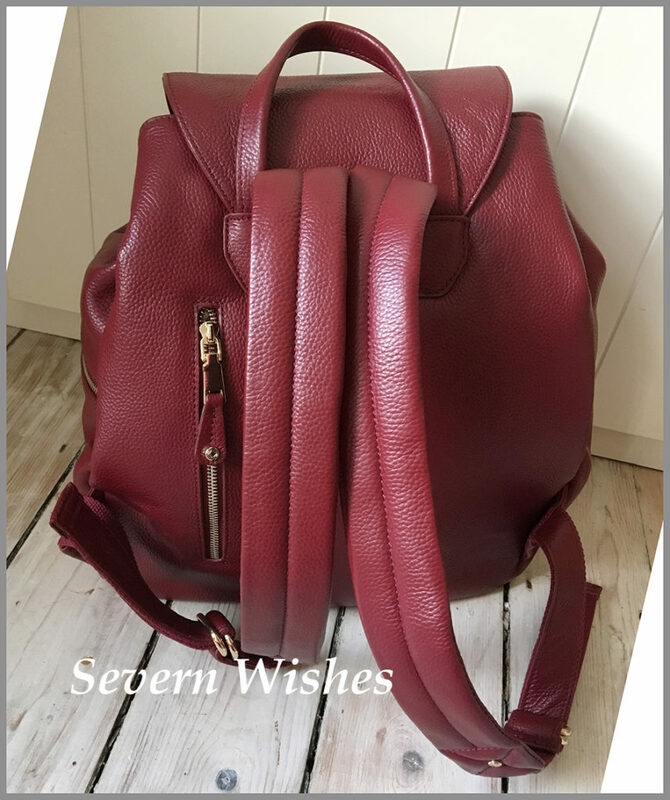 Thank you for supporting Severn Wishes blog today, don’t forget there are plenty more reviews to read across the website, just click one of the categories that interest you on the main page. I hope that you have enjoyed this review and I wish you a wonderful rest of your day. 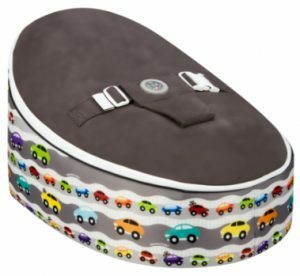 My husband and I purchased a Poddle Pod at the Manchester Event City Baby and Toddler Show in March. It cost £34.99 (special price for the event) and we chose the Nelly Parade cover. We were impressed with the demonstration of the product, and I had also followed the company for some time on Facebook. I was adamant that I wanted one of these for when our baby came along. Poddle Pod have many designs, some are unisex and others are more suited to a gender of baby. But not only do these make great items for parents to buy, but they also make a great gift to expecting parents, that is my honest opinion because it has become extremely handy to us. Most newborn babies love to be held in someones arms, cuddled and cradled. However this isn’t a practical part of every day life for many of us. Poddle Pod has been designed to give parents a few hands free minutes while ensuring baby is comfortable and safe inside the inner shape of the Pod. 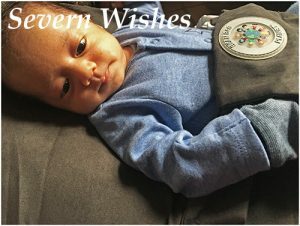 It has a very clever design which is weight activated, this allows the baby to supported and makes them think they are being held. It’s heavier than you would think to pick up, and has a soft fleece side and a patterned cotton side to the machine washable cover. 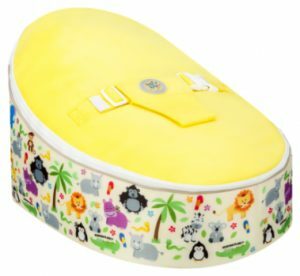 The Poddle Pod is made from high quality fabrics and the filling of the pillow is both anti fungal and hypoallergenic. The best part for me is that it’s also made here in the United Kingdom, and you all know how I love to support businesses in out country above all others. Poddle Pod is currently available in two sizes, which are 0-6 months and 6-36 months of age. I would certainly consider ordering a larger Pod when our son grows out of this current one. 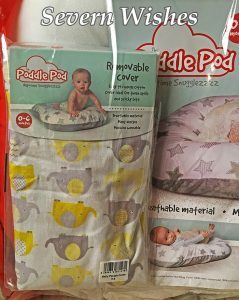 I wanted to include my husbands thought in this review, so here are what both us think of our Poddle Pod purchase. I like the convenience of the Poddle Pod, it is easy to move around the home or to take with us to visit family. It’s unique internal shape is a comfort to our baby and we often find that placing him inside it to chill out during a cry is really handy. Not only does baby like resting but also sleeping inside the Poddle Pod. I have often placed baby inside the Pod after a feed and a winding, so that I can keep an eye on him as he dozes before placing him into his basket. The shape and size of the Poddle Pod is ideal to lay on several surfaces including the bed and the sofa. Many a time have I been running errands in a room and placed my sleepy baby inside the Poddle Pod knowing he will be comfortable. 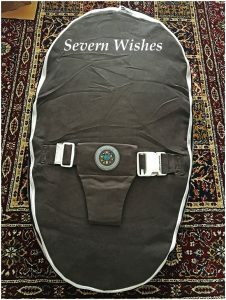 I was very happy with the overall quality of the product and the material is excellent, easily washable and to get on and off the item using the zip. This is a rather useful item that I am very happy that we purchased. So far it has been durable and has held it’s shape during the first eight weeks of its use. 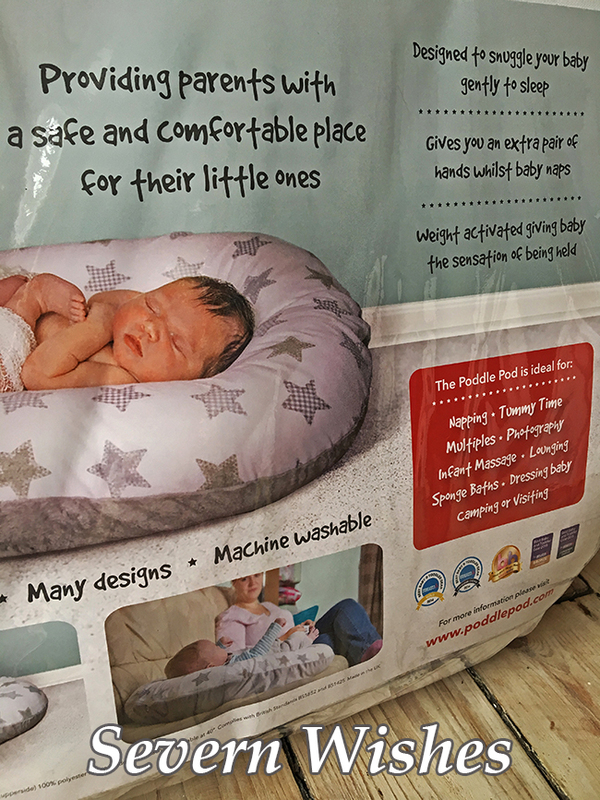 I would certainly recommend this product to first time parents who may need somewhere safe to lay their baby down at times. 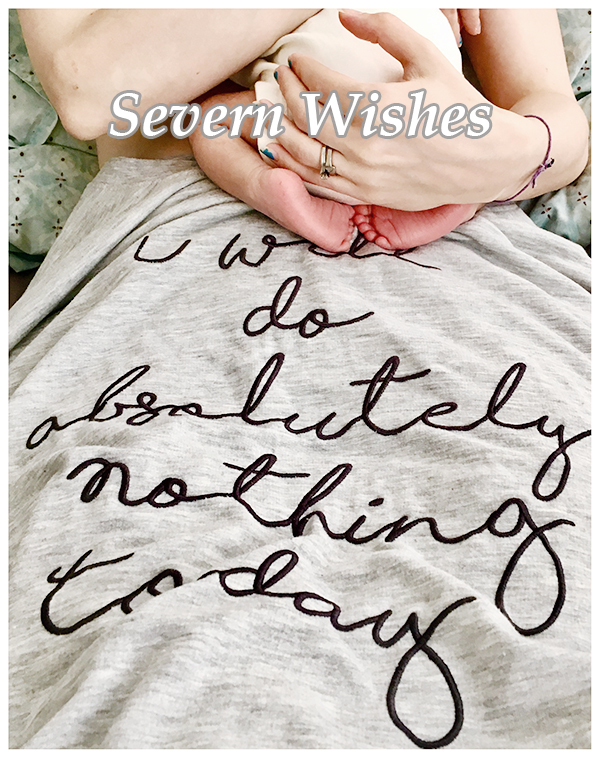 Especially if they are feeling overwhelmed with the need for baby being held, this allows a few moments of respite for them while they do daily things. Even having a warm cup of tea or a hot meal can make all the difference in those first few weeks of being a new parent. The Poddle Pod can aid people in achieving this with its clever design. I liked that the Poddle Pod fitted comfortably inside our travel crib for comfort while sleeping away from home. We like the overall design and the shape commits to holding our baby safely. 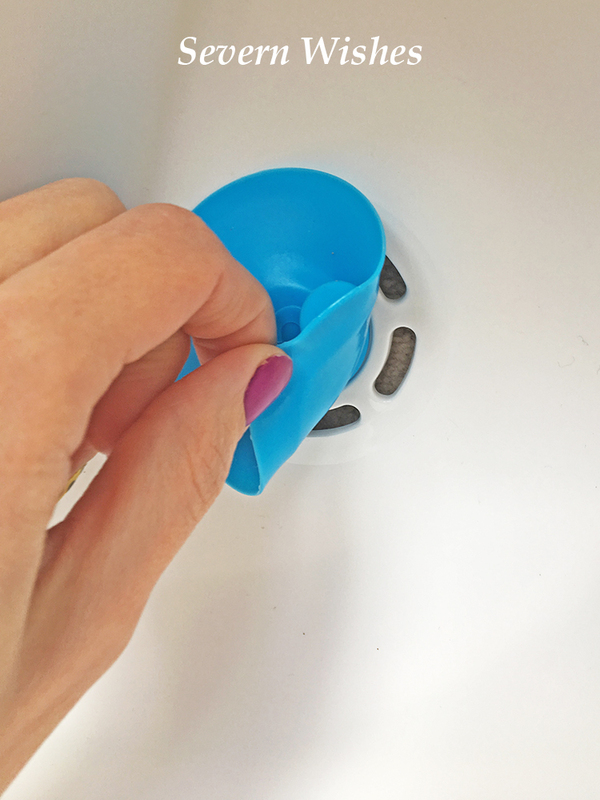 The cover is convenient to remove when requiring a clean and we purchased an additional cover so that if one is in the wash we can still use the Pod. 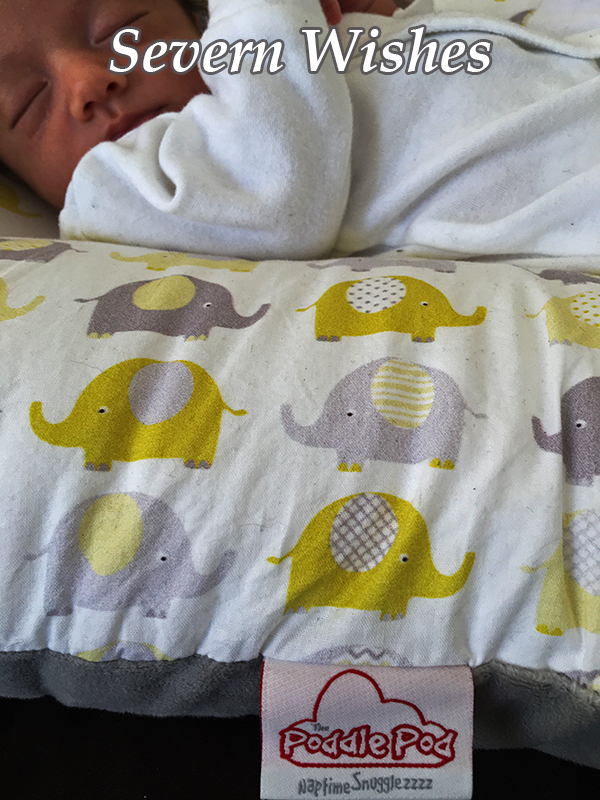 We chose the Elephant design due to the nature of our nursery theme and are happy with the quality of it. Although there were many great designs to choose from, and we would consider other ones when we get the larger Pod in the future. If you would like to receive 10% off your purchase of Poddle Pod then follow them on Facebook (link below) and use the code FB10 on their website. 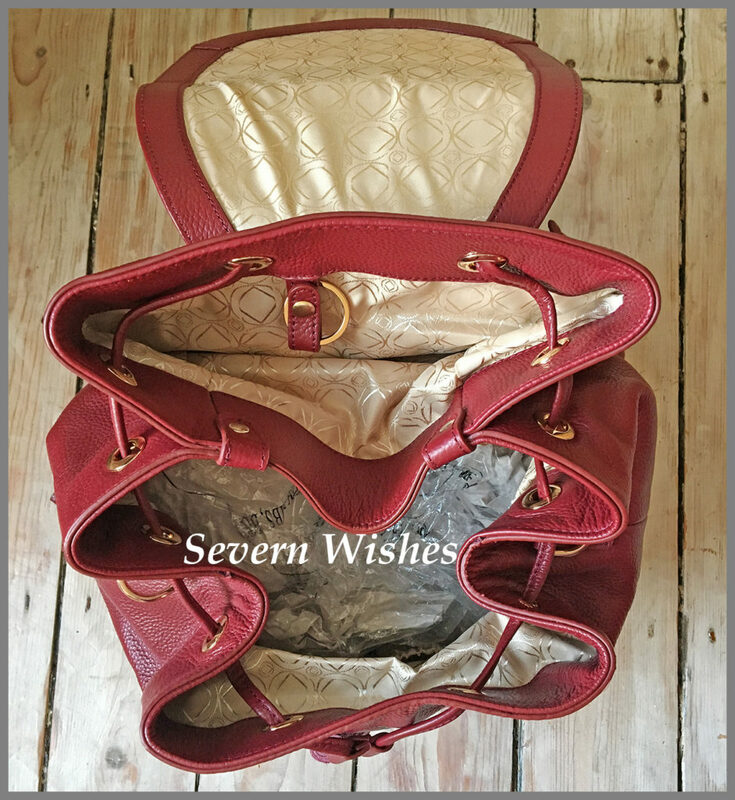 Thank you for supporting Severn Wishes blog, I hope you have enjoyed this review and I wish you a wonderful day.